This week’s Mani Monday is inspired by the lovely Zooey Deschanel and her daisy-inspired nails courtesy of celeb nail technician, Tom Bachik for L’Oréal. But I tried, and that’s all that counts! 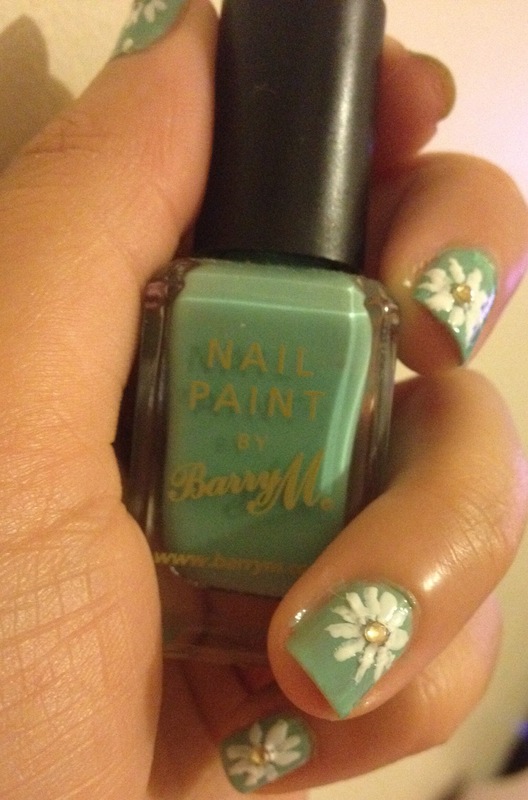 Unlike Zooey, I fancied a base coat, so since spring is still trying to make an appearance, I thought I’d go for a pretty pastel colour, Ming Green by Barry M.
I personally feel with a colour behind them, it makes the daisies stand out that little bit more. I used yellow gems for the centre of my daisies – for a tutorial on how I attach the gems please see this previous Mani Monday post. The daisies are pretty hard to do, and even harder when you’re using your non-dominant hand. Because of this, I only put daisies on odd finger where I fancied really, there was no order and I placed them in different places on the actual nail, so they weren’t all centred. This gave it a pretty cute look actually, and well, I’m pleased with myself! Have you tried this mani? If you have any pearls of wisdom for me, get in touch, I’m always willing to learn! This is by far the easiest, classiest manicure you can have. Best bit? Super easy, simple to maintain, and it looks oh-so-cute! The guides were from Boots and I think these are the better ones, I have used cheaper ones in the past, but these really stick to your nails so you get a nice clean line and no puddles near your skin. Make sure you clean your nails properly and treat them. To get the best results, my usual routine is here. My nails are prone to chipping, especially on the edges, but I have found with this mani it is seriously reduced, probably due to the amount of varnish going on the very tips of the nail. For this I used Barry M Matte White for the tips, with a sally Hansen nail hardening top coat, it really is that simple! Just use two coats to get the pure white finish and you’re set. The best thing about this simple mani is you can jazz it up with gems however you wish! Just use a decent nail glue and follow the steps to nail gem application in this post. Now, today is supposed to be the most miserable day of the year. It’s cold, we’re all tired, and well… it’s Monday. But that is no excuse to have fancy nails! So here is my attempt at some budget velvet nails. 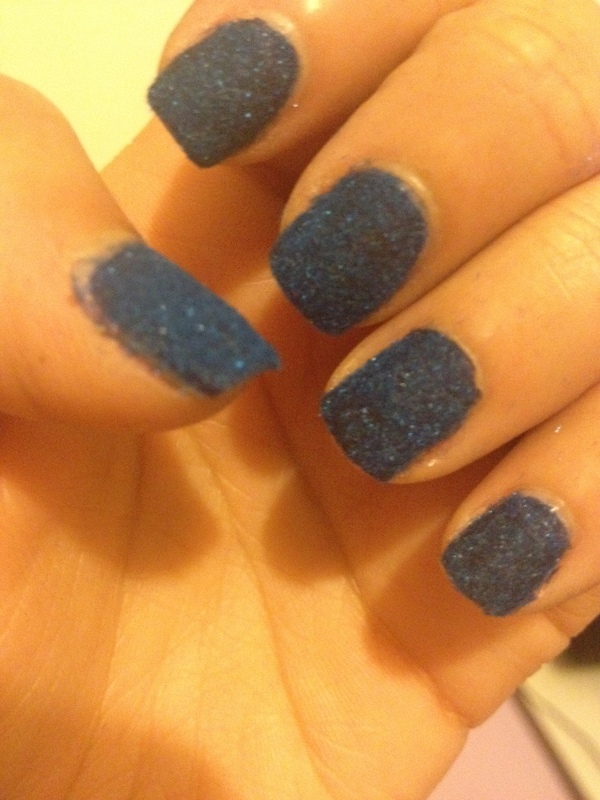 I purchased the velvet pots from Poundland, so I thought I’d team it with my favourite Barry M Navy Nail Paint. 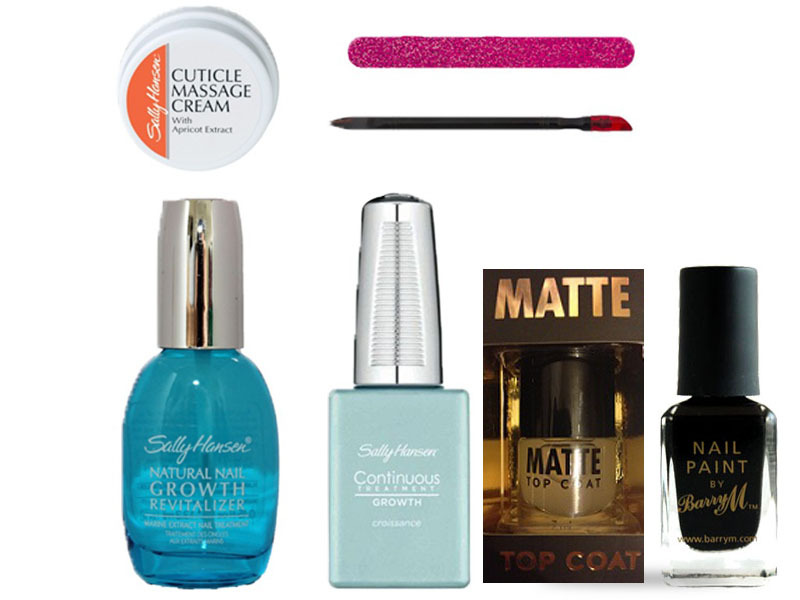 First clean, scrub, soften and protect your natural nails and have a decent base coat. 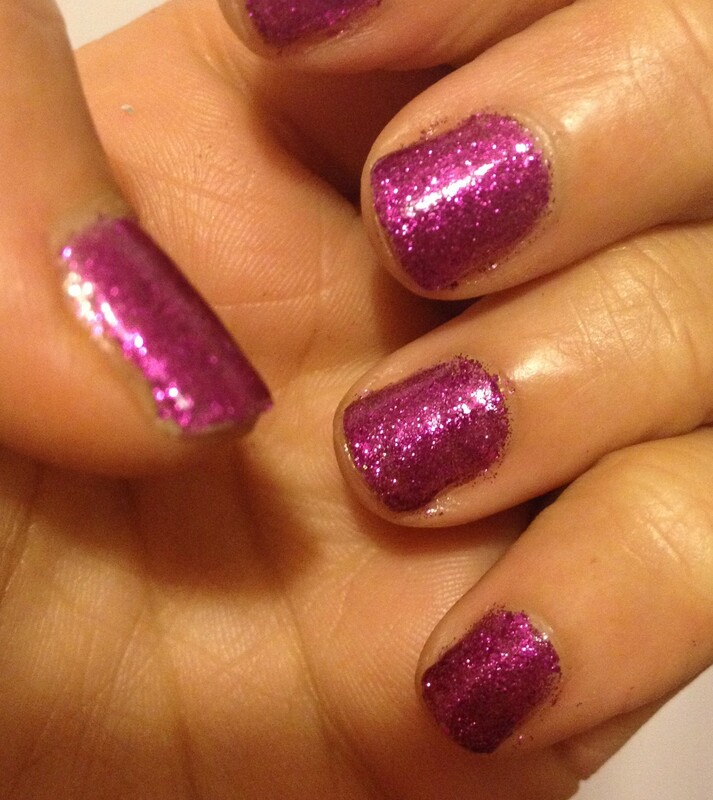 Then add two thin layers of your chosen colour nail polish and let them dry thoroughly. Finally, put on a nice layer of your top coat, and whilst it’s still wet sprinkle the velvet over your nail, and gently press it in so it sticks. 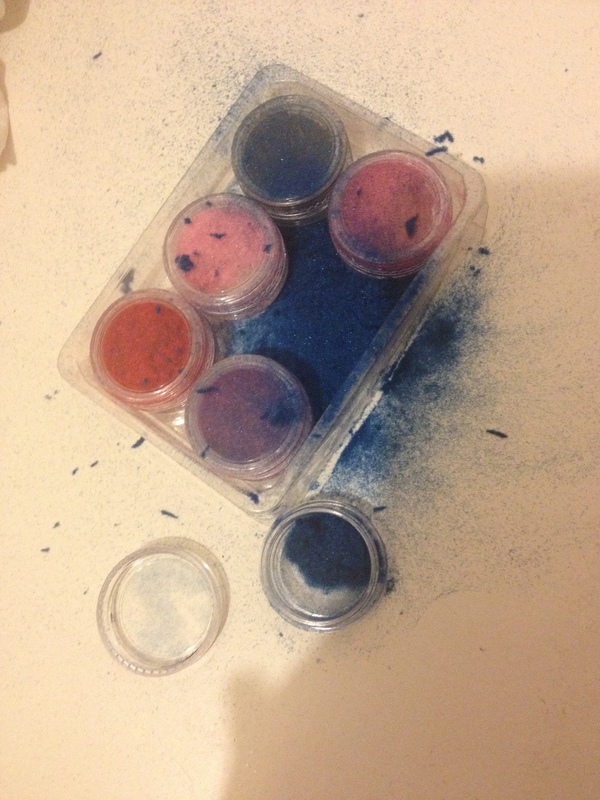 I used the plastic tray that the pots came in to catch all the waste, it gets messy! It’s no fun cleaning up, so be careful!